At Wenceslas Square 39, access to the apartments is via a brown door between Ristorante Italiano Buschetto and Restaurant Café Svateho Vaclava. 10 well furnished apartments set in an excellent central Prague location, in the middle of Wenceslas Square. Restaurants, shops, bars and clubs are just out the door. The stylish 3* Wenceslas Square 39 Apartments are spacious and bright, and are set in a large apartment house overlooking the main square. Choose from one, two and three-bedroom apartments. 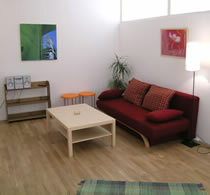 Apartments feature a choice of single or double beds. All come with lounge/dining areas, fully equipped kitchens and modern bathrooms with a shower. Facilities include: bed linen and towels, refrigerator, hob, microwave, cooking utensils, kettle, coffee maker, toaster, crockery, cutlery, washing machine, dishwasher, iron, hairdryer, Satellite flat-screen TV, safe and free Wi-Fi. There are bars, cafés and restaurants to discover all around Wenceslas Square, plus a Starbucks and Costa Coffee just metres away (see 'Nearby Places' for restaurant and pub recommendations). Secure underground parking is available nearby at 30 EUR per day. Marks & Spencer, which is opposite the apartments, has a food and wine section and a bakery. Desirred Department Store, which is a few meters down the square from the apartments, has an Albert supermarket beneath it. And 5 minutes walk from Wenceslas Square is Tesco, the largest food store in the centre of Prague.